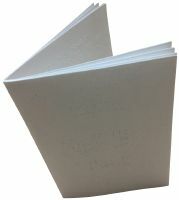 Include Braille Rules on How to Play Othello for $5.00? A great tactile game of skill. Dot on green end of peg; black end is smooth. Complete with wooden board and storage box. Measures about 6 in by 5-1/2 in by 1-1/4 in. Even among experienced players of Othello, there is controversy regarding tactics and strategy. And while kids may not get into the finer points of a perfect game, adults can spend a good deal of time on each move, contemplating the best possible place to put their peg. Here, then, is a timeless game for all ages, requiring skill, forethought, and just the right amount of good fortune! So what's it all about? 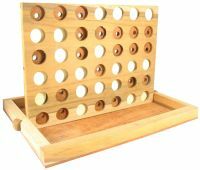 Briefly, the object of Othello is to outflank your opponent, ending up with the majority of pegs on the board in your color. Each time you move, simply place a peg on the wood playing board in such a way that you have a peg on either end of an opponent's row. Then, all the outflanked pegs become yours - they are flipped over to show your color. Of course, there are lots of ways to prevent this, and everyone has a different idea on how to play. So remember, each new opponent means a new strategy, and a whole new challenge! Finally, you'll find that there's a dot on the green end of our Othello pegs, and the black ens are smooth, so blind players can tell by touch whose pegs are whose. And our Othello set even comes complete with a wooden storage box to keep everything self-contained. We have Othello (Tactile) in stock, delivered with free shipping. Click below to order. 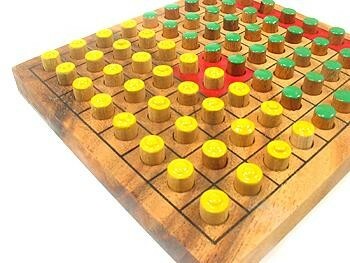 Equipment: The Othello game board: 64 squares. You'll also need 64 pegs (or discs): white on one side, black on the other. Preparation. Divide the pegs evenly between both players, so each has 32 pegs. Object of the Game. Put simply, you'll need to outflank your opponent and flip his pegs to your color, ending up with the majority of pegs on the board in your color. TO OUTFLANK means to place a peg so that you have a peg of your color at each end of an opponent's row of pegs of his color. 1. Each player chooses one color to use throughout the game. 2. Black places two black pegs, and White places two white pegs on the board. The game always begins with this set-up. 3. Players choose who goes first. 4. A move consists of taking a peg from the compartment and placing it so that it completes the outflanking of one or more opposite color pegs, then flipping the outflanked peg(s) over to your color. For example, white peg A is already in place on the board, at one end of a row of black pegs. By the placement of white peg B (at the other end of the black row), the black row of pegs has been outflanked. Thus, all the captured pegs are flipped and this row becomes white! 5. A player must always outflank his opponent and flip at least one opposing peg in order to move. If he cannot make a move, he loses his turn and his opponent moves. 7. A peg may outflank in any direction: horizontal, vertical, diagonal, forward or backward. 8. A peg may outflank in any number of directions at the same time. (Theoretically, it is possible to flip in up to 8 directions at once.) Pegs may only be flipped as a direct result of a move. 9. 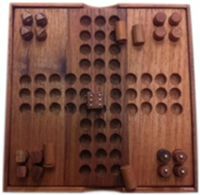 The game is over when the board is entirely filled with pegs, or when it is not possible for either player to move (i.e., out flank an opponent's row and flip an opponent's peg), or when the board is filled (or partially filled) with all one color. At this point, pegs are counted up. The player with the most pegs is the winner. Helpful Hint. When placing a peg for a multiple move, keep your finger on it as you flip pegs over in the various directions, to help you determine the direct diagonal, horizontal and vertical moves that result from that point. 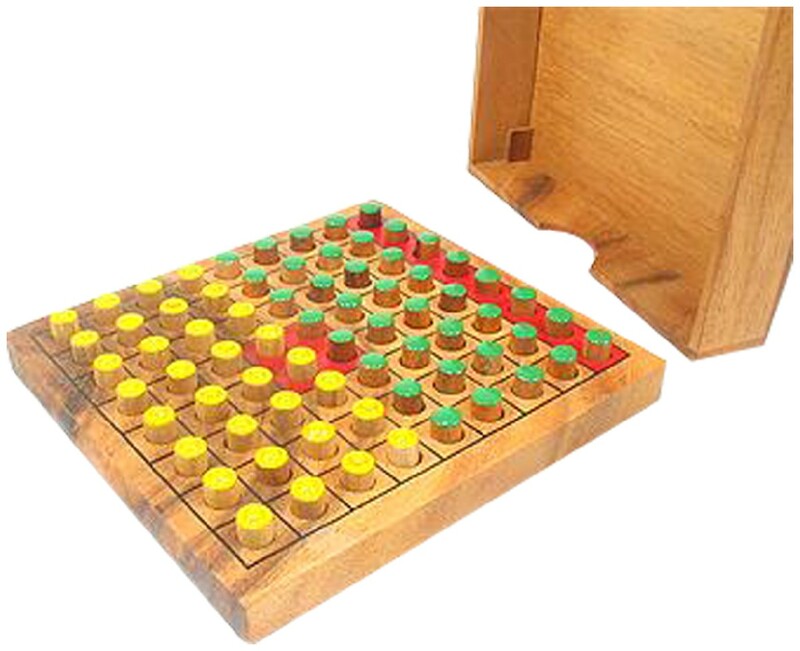 To determine the degree of skill with which a player won the game, subtract the smaller number of pegs from the larger number. For example, at the end of the game, let's say Black has 37 pegs on the board, and White has 27 pegs on the board. Black won by 10 pegs. If you win by 54 to 64 pegs, we call that a perfect game. Taking note of your scores as you play will give you an idea of how your skill is improving. Players may also establish their own methods of scoring. Try playing a predetermined number of games and trying to win the majority of them, such as two out of three games. Another way to play is to establish a predetermined number of points to win by. For example, over the course of a series of games, the first player to accumulate 100 winning points would be the winner. 1. Pegs may only be flipped as a direct result of a move. Pegs to be flipped must fall in the direct line (horizontal, vertical or diagonal) of the peg that was placed down. 3. It is not necessary to flip a complete row of pegs. However, all pegs outflanked in any one move must be flipped. 4. It is not permitted to place a peg that does not immediately flip an opposing peg. 6. If it is not possible to place a peg that will flip an opposing peg, the player must pass and forfeit that one turn. 8. If a player makes an incorrect move, and the opponent has not placed a peg yet, the pegs may be corrected. If the opponent has already taken his turn, it is too late and pegs remain as if the move was a correct one. Even among experienced players of Othello, there is controversy regarding tactics and strategy. In fact, it may be fun not to read the following hints until you have played a few times, and formed your own ideas. In any case, the following deals primarily with board positions and their advantages; but remember each new opponent means a new strategy, and a whole new challenge! 1. A peg in a corner cannot be flipped since it would be impossible to outflank it. Note, however, it can be a permanent end for three directions. Thus, a corner is very valuable and it is a great advantage to occupy a corner square. 2. The effectiveness of a corner can, however, be diminished by the opponent's maneuvering a solid defense in against it. While a corner is undoubtedly a strong position, it is not necessarily true that gaining one or more corners assures winning the game. 3. The squares directly adjoining the corners are also important. By taking these positions, it is possible to defeat the strength of the corners. 4. Pegs placed along the outside edges are also valuable because they can be outflanked in only two directions (left and right of the peg itself) yet can act as the outside end for five directions. 5. The next rows in from the four edge rows could be considered a "danger zone," since a peg in these rows could be your opponent's bridge to a corner or an outside edge position. 6. While the move that flips as many pegs as possible may seem the most attractive, sometimes the less dramatic move is the wiser move. 7. A solid block of one color, especially backed up against a corner or side, is often the key to winning the game. 8. On the other hand, aggressively infiltrating into a solid block of one color can often change the tide of the game. 9. There is a slight advantage to going first. Therefore, the more experienced player may give this advantage to the less experienced player. And after one game, the winner may wish to let the loser go first. These rules should be established before starting a series of games. 10. When a skillful player is playing against an unskilled player, the skilled player may take on a handicap by setting up the board to give his opponent a four corner advantage. If the difference in skill is not so great, the skilled player may give only 1, 2 or 3 corner advantages. You will note as you play, that the board can radically change with each and every move. As it does, so do each player's chances of winning. Therein lies the excitement of Othello--it's "anybody's game" until the last minutes. Happy playing!